You will be invited to anonymously respond to the question by choosing 1 of 6 options, ranging from ‘extremely likely’ to ‘extremely unlikely’. It may seem unusual for us to ask if you would ‘recommend’ for your friends and family to use our services. It is important to understand that this is if they needed similar care or treatment to you. We are not wishing anybody ill! It is really important to us that you tell us why you gave your answer, so please answer the follow-up questions. You do not have to respond to the question. But if you do, your feedback will provide us with valuable information to help us provide the best possible experience of care for future patients. Our staff can see the results at any time. 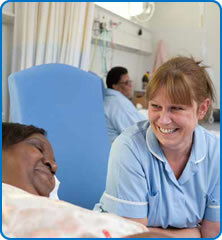 The feedback you provide is shared with staff to either make improvements or to celebrate and share good practice. We also use the feedback to look at the organisation as a whole in comparison to other NHS organisations.